I met Zazie at the park on the first sun-baked day of spring. I was ablaze. I had an idea for a story and needed to share it with someone who could really take the heat. Zazie is open, wild, a free-thinker. I spilled the title first but before I could say another word, she said tartly, trees don’t talk, B. I was taken aback but got it together, insisting they do. She shook her head and smiled exactly like my husband did when I first told him. Heat stung my cheeks, I argued, how do you know, you’re six years old? Zazie shook her head and slowly repeated, trees… don’t… talk. She caught my fluster and stared me down. Her eyes rolled. I felt my feet sink into the earth and knew then that it was time to expand the universe and blow her formally educated mind. I suggested she listen for herself, and pointed a few feet away where a towering 150 year-old Maple had been following our conversation with interest. It smiled, but at that point, only I could see. Zazie slipped her tongue back in her mouth and moseyed over. Imagine how many kids have told this tree their most secret secrets? I provoked. The Maple grunted her approval. Zazie looked back at me and gulped. Nervously, she touched the tree and inched her way in, fingers whispering over its ancient bark. The Maple sighed. Birds twittered in the sky. Zazie leaned in. I could swear I saw her lips move. I knew then that her resolve was broken, that Zazie’s heart and mind had opened wide. The birds tweeted her name through the branches. The sun winked down at her from the sky. Only now could she hear what she needed to know. First: magnificent™ post. Your voice is so “humane”, for lack of a better word. Second: I hear Le Clown is shorter in person than his on-line persona. Thank you, Le Clown. Like a tree, you stand tall. She can love and hug trees without having to believe that they can talk. That to me is truth and connection. Yes! She doesn’t have to believe that trees can talk, but she has to know that they are alive. Lovely, playful post. Like the 2 separate photos of facial expressions a lot. I think trees talk, but like with any living thing you have to listen. I can feel the syrup flowing. What are you implying, Joe? No doubt they hear and feel you, too, Jackie. Hawaii!! Great story and pics! I wrote a story one time about the Oak and the Willow. I had property on a lake where on one corner of the lakeside lot stood a 150 year old gnarled oak, and the other a 15 year newly planted Willow. One spring evening, I laid on the hillside as a slow moving storm came in frow the southwest over the hill and lake. I eavesdropped as the wind carried the conversation back and forth as the Oak shared his wisdom with his newly planted best friend. Trees talk and definely hold many life secrets they’d happily share if we could just learn and take the time, to once again listen. Thanks for sharing, Vagabond Ted. You hit the nail on the head: taking the time. Your post made me realise how cynical I have become. I don’t speak to trees any more. I totally must try again! Yes, try again! I don’t really care if talking trees can be proven scientifically. I’m listening. Thanks, NJ! I’ll bet the trees are laughing because your feet are not planted in the earth. Imagine if we lived like trees? That we could stand still for so long and be so Zen? Another post. 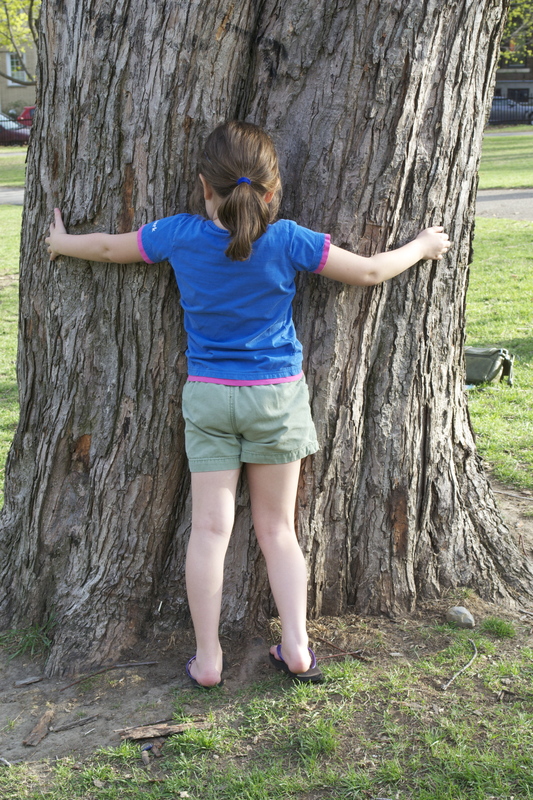 There’s no time like now to hug a tree and make friends! Glad to hear you overcame your clown fear and met the king of blogging! Hey, where is your “About” page? Glad you’re glad, Becca, as I am a fan. You are lucky! what did they say? Reblogged this on Does the Future come about because of our past?. Thanks so much for the reblog and welcome! Great story Brenda ~ Almost simultaneously crossing my mind ~ three thoughts occurred to me while reading your wonderful post. I first Googled “The Giving Tree” – never knew it was received with such a backblow of critism as well, so expect your own. I thought of how many trees (usually) younger couples have etched their initials BG💜BK 😘 Forever telling of our friendship or romance ~ if you were only a boy… And, how I buried me Hamster under the tree that I went to sit quietly and think or and use as a launching pad tossing about canned corn to the dozens of ducks who were simple hanging out in the water while under it expansive shade. So, I learned about love from “The Giving Tree;” Declared my love for a boy, there by “Came Out of the Closet.” And having enjoyed its serenity and ability to enjoy playing with countless ducks!. That’s lovely, Brian, thank you for sharing.